Home > News & Events > A Successful Groundbreaking Ceremony Filled With Excitement at Webster Park! A Successful Groundbreaking Ceremony Filled With Excitement at Webster Park! 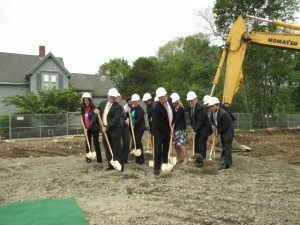 On Thursday, June 4, 2015 and in a groundbreaking ceremony filled with excitement and anticipation, the executives at Marquis Health Services welcomed high ranking dignitaries and guests, to break ground on Webster Park’s upcoming revolutionary subacute care unit. Featuring a fabulous design by AE Design Group, Architectural Plans by David H. Dunlap Associates, Inc. and upcoming Construction by NAPCO Construction LLC, the groundbreaking ceremony at Webster Park Rehabilitation & Healthcare Center filled everyone attending with enthusiasm and expectation. Kim Ferris Webster Park Director of Nursing, David DeCoste State Representative 5th District, Kathleen Ferranti Webster Park Administrator, Dr. Ravidner Soodan, Webster Park Medical Director, Regina Brown, Marquis Health Services Regional Director of Clinical Services, Dr. Sridhar Dasari, Webster Park Pulmonary Physician, Kristen Ward, Webster Park Director of Admissions, Matt Muratore, State Representative 1st District Plymouth, Jennifer Carnovale, Marquis Director of Operations, David Dunlap of David Dunlap Architects, Matt Nelson of David Dunlap Architects, Norman Rokeach Marquis Health Services Chief Executive Officer. ← The Excitement is Building Up: Webster Park is Breaking Ground!